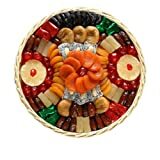 This Dried Fruit Round Basket (Large) comes with 2 lb. 12 oz. of assorted dried fruit from the fertile California Valley. Product includes: dried pears, dates, coconut rolled dates, prunes, apricots, apples, pineapple, cherries, and peaches. Treat yourself, or give as a gift. Since this product is Gluten-Free, Kosher, Low-fat, Non-GMO, Vegan, Vegetarian, and Low-sodium, it is a suitable gift for anyone!Express your appreciation to family, friends, clients, and associates this holiday season with a healthy and thoughtful gift basket of assorted dried fruit from Broadway Basketeers. This generous, large basket provides two pounds, 12 ounces of sweet, healthy, and delicious dried fruit from the fertile California Valley. 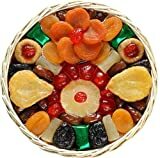 Hand-crafted and beautifully arranged, the assorted dried fruit basket includes dried pears, dates, coconut rolled dates, prunes, apricots, apples, pineapple, cherries, and peaches. This elegant and tasteful gift is pleasing to the eye and palette, and is filled with foods that almost anyone can enjoy regardless of dietary restrictions. This 1 lb. 4 oz. Irish St. Patrick’s Dried Fruit Gift Basket is in a league of its own. Fresh-packed with an assortment of dried dated, coconut rolled dates topped with almonds and foil wrapped dates. Express your Irish passion with this green clover gift basket. Hand-packed to insure optimal freshness and presentation. Gluten-Free, Kosher, Low-fat, Non-GMO, Vegan, Vegetarian, and Low-sodium; Good source of potassium and fiber. The Organic and Natural Gift Basket is the ideal gift for anyone seeking a healthier option. When looking for an organic and natural gift, sending this gift basket will be sure to please. Organic gift basket contains cherry sweets, organic cinnamon apple chips, organic tea in two flavors, natural healthy mix, organic cheddar cheese sandwich crackers and organic peanut butter cookies. The Organic and Natural Gift Basket is the ideal gift for anyone seeking a healthier option. When looking for an organic and natural gift, sending this gift basket will be sure to please. Organic gift basket contains cherry sweets, organic cinnamon apple chips, organic tea in two flavors, natural healthy mix, organic cheddar cheese sandwich crackers and organic peanut butter cookies. This gift basket is aesthetically pleasing and hand arranged for optimum design. A hand-tied bow finishes off the gift basket. This organic and natural gift basket is kosher, too, so no one has to feel uncomfortable receiving your gift. This Touch of Class Gourmet Gift Basket arrangement will be sure to impress even the most discriminating consumer. This Kosher gift includes mounds of roasted cashew nuts and almond nuts alongside a luscious dried fruit medley. Truly a gourmet gifting experience. Hand-tied with a bow for a finishing touch. The Ultimate Holiday Gift Tower is just that… the ultimate gifting experience. For the Holidays or any occasion, The Ultimate Gift Tower is the perfect gift! With an abundance of gourmet foods, this six-box tower is impressive enough to send to the office. 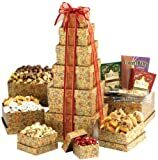 Tower includes: chocolate covered cherries, salted pistachios, honey mustard gourmet pretzels, chocolate chip cookies, yogurt covered pretzels, fruity trail mix, chocolate-drizzled caramel popcorn, chocolate covered nuts, hot cocoa, biscotti and more! This gift tower is hand arranged to maintain optimum design and tied with a bow on top. All products in this gift tower are kosher, so no one has to feel uncomfortable receiving your gift.